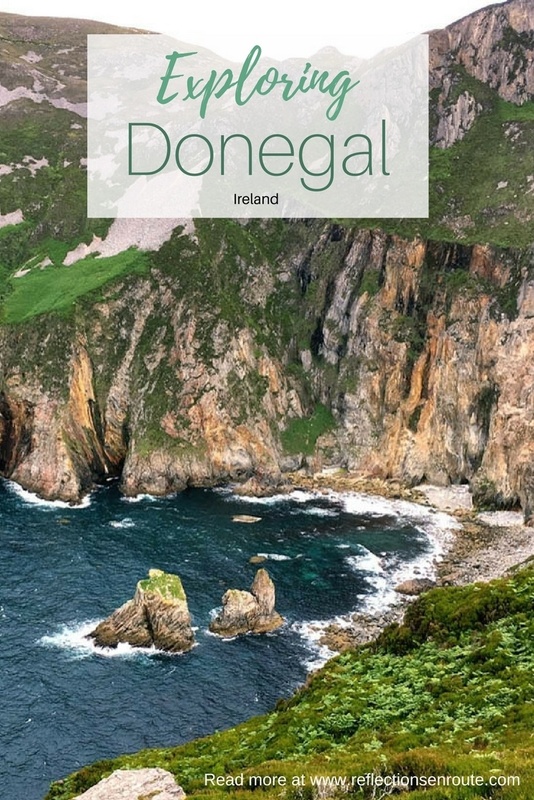 Have you been to Donegal? 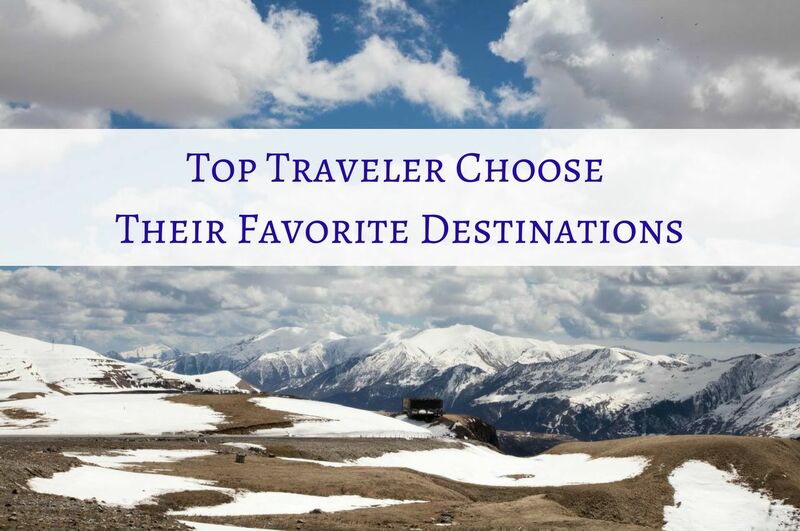 What is one of your must-see attractions? Our Ireland trip was a real mix of adventure, road trip, and family time. Our entire family travels in some form or another, and going to Ireland we were planning on meeting up with both daughters, Jim’s sister and step-mother. There are so many things to do in Ireland, it is important to plan out and focus on a region. For this trip we were excited to make our way along the WIld Atlantic Way. Since our first stop was our amazing time on Skellig Michael, we met Ginny and Erika right outside the airport so we could start our road trip right away. In fact, as you probably noticed, we’ve encouraged some of our family members to write for Reflections Enroute and now we can add Ginny to our author list. The rest of the post is written by her, and all but one of the photos is hers as well. I lay claim only to the photo of the Friary. Read on as Ginny can tell you what we found to be the top things to do in Donegal. 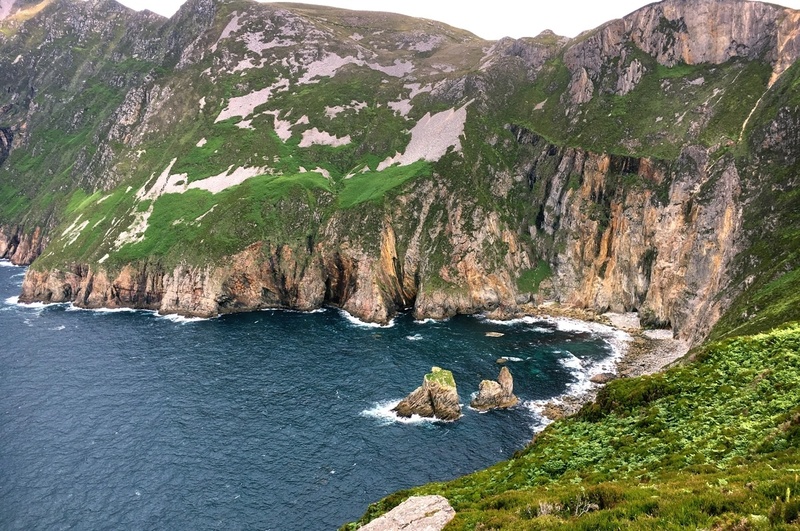 The cliffs of Slieve League on the Wild Atlantic Way are one of Ireland’s hidden gems. Donegal County is the northernmost part of the Republic of Ireland. Bounded on its north and west sides by the North Atlantic Ocean, it’s rugged, remote, sparsely populated, pristine, and beautiful. It’s little wonder that National Geographic Traveler declared it the #1 coolest place to visit in 2017 . The county is also the northernmost section of Ireland’s new tourism route called the Wild Atlantic Way. 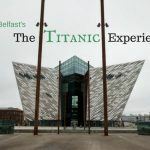 When it officially launched in 2014, Ireland’s Minister of Tourism called the Wild Atlantic Way the “journey of a lifetime.” It winds for 2,600 km along Ireland’s Atlantic Coast from Kinsale in County Cork to the Inishowen Peninsula in County Donegal. We rented a car and drove a good portion of the Wild Atlantic Way, what fun! The roads in Donegal County are narrow and winding; it takes time to get around, but it’s worth the effort. There are remote beaches, romantic lighthouses, colossal cliffs, hiking trails, and, for us animal-loving photographers, lots of great sheep shots. Slieve League (Sliabh Liag) is not-to-be missed. It’s a mountain with 600-meter high cliffs plunging into the wild Atlantic; signage at the sight claims these are the highest cliffs in Ireland. Unless you’re looking for a hardy hike, don’t park at the first gate you encounter — open the gate and go through. The gate isn’t there to keep people out; it’s there to keep the sheep in. A second parking lot is located further up the road and much closer to the cliffs. 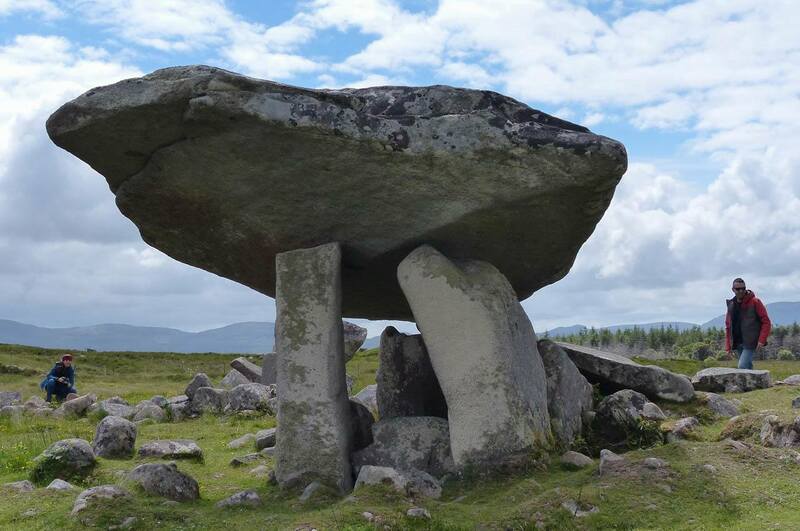 While driving around Donegal County, we visited beautiful crescent beaches, stopped by Assaranca Waterfall, and found a stunning dolman in a sheep pasture behind St. Conal’s Church in the Townland of Kilclooney More. Donegal Town is at the southern end of Donegal County where the Eske River flows into Donegal Bay. It’s a small town (about 2,400 residents), but there is ample lodging, good restaurants, and plenty of friendly pubs. 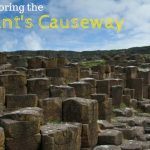 It’s perfect for day-tripping to other parts of the county, and it has a full day’s worth of sights including the Donegal Bay Waterbus, Donegal Castle, the Friary, and Bank Walk. The 75-minute boat tour of Donegal Bay is the most popular sightseeing opportunity in Donegal Town. The informative commentary points out features around the bay, provides historical insights, and is laced with Irish humor and spirited song. Donegal Harbour is home to a colony of Harbour seals, and, if the tide is right, you’ll see groups of them lounging on the sandbars around Seal Island. 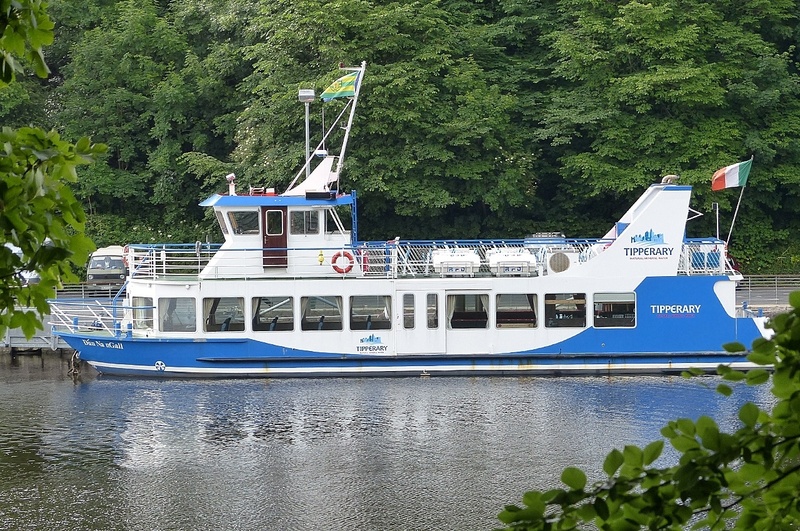 The Dún Na nGall is a comfortable, 160-passenger boat which provides a smooth ride on the bay and is equipped with a full bar and restrooms. There are 2-3 tours a day, but the schedule changes with the tide. Visit the Waterbus office on Quay Street or the website for the schedule, tickets, and more information. Take time to tour the fully restored Donegal Castle located in the center of town on the bank of the Eske River. It was built in the 15th century by the chieftain of the O’Donnell clan, Red Hugh I. Guided tours are offered hourly, or you can wander through the castle on your own. According to the Friary’s signage, “Donegal Friary was founded for the Franciscan Friars in 1474 by the first Red Hugh O’Donnell and his wife.” It was repeatedly attacked and taken over by the English. 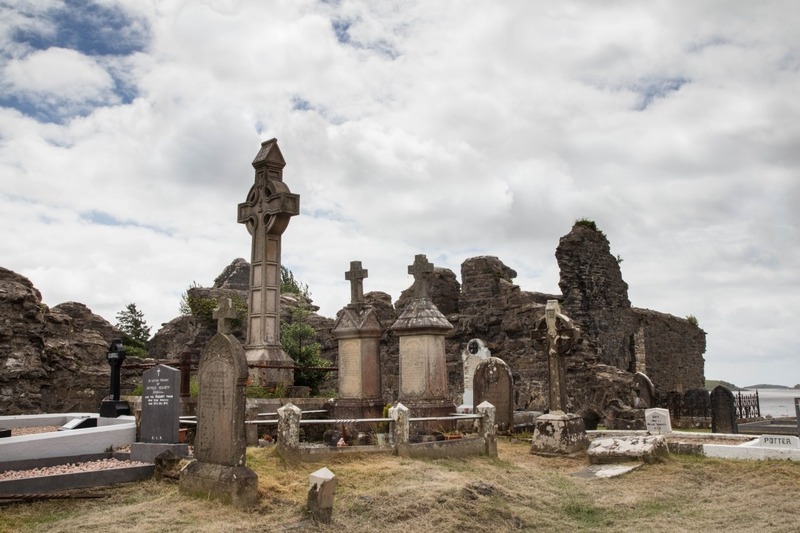 The Friary’s claim to fame is that Monks, who fled the Friary, are credited with compiling the ancient annals of Ireland into the Annals of the Four Masters — major source of Irish history. The abbey is now a ruin enmeshed in a cemetery, but it’s certainly worth wandering through and offers some nice photo opportunities — especially of Celtic crosses. 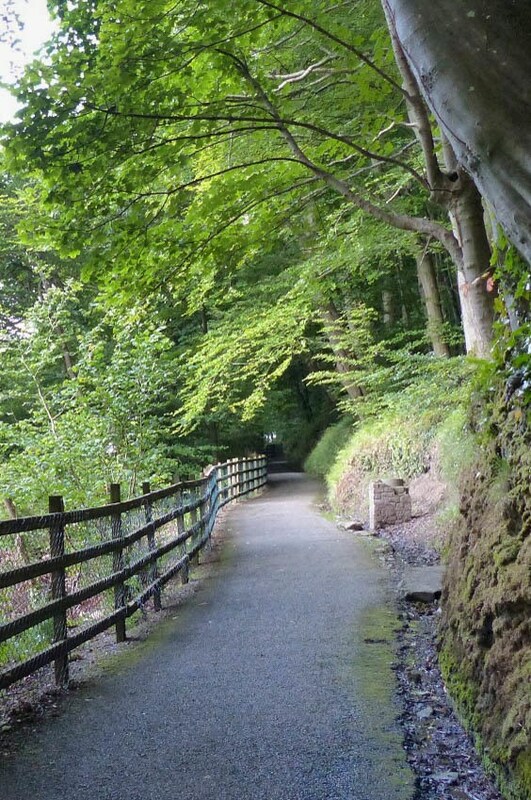 The Bank Walk is a 1.6km trail that begins at the Eske River Bridge and follows along the riverbank and the edge of Donegal Bay. There are views of the harbour and the Friary, benches to sit and commune with nature, birdhouses in the trees, and even a whimsical Post Box for Fairies. It’s an easy, pleasant walk. Without a car, there’s no easy, convenient way to travel around Donegal County and visit sights like Slieve League. There’s an airport about an hour north of Donegal Town with flights from Dublin, but typically visitors fly into Belfast or Dublin, rent a car and drive. Donegal town is 177km from Belfast and 225 km from Dublin. As often happens when traveling, we ran out of time before running out of things to see, especially according the Best Ireland Itinerary. With one more day, we would have gone to Glenveagh National Park and castle, and Mount Errigal. Now we have a good reason to come back. You won’t go wrong with the Abbey hotel right smack in the center of Donegal Town. This beautiful stone faced hotel has rooms with bay views and an excellent restaurant. Rooms are very comfortable and offer good value for the price. Check out the Abbey Hotel in Donegal! Pin Discovering Donegal for later! Michelle, Ginny says thanks and so do I. Traveling definitely is our family tradition and writing about it is just a bonus we all enjoy! Michelle – Thank you for commenting on my post. Corinne mentioned that travel is a family tradition. An extension of that tradition is that we’ve also traveled together as a family, and it’s a wonderful way to spend time with family. Ginny – what an interesting post. My ancestors came from Ireland and yet I have never been there. The unreliable weather has put me off . Reading your post makes me want to plan a trip though – perhaps I will add it to the bucket list. This looks like an interesting area with some interesting history. The castle looks vey well restored. Rhonda, It’s a cute town, and the castle is small but nicely done. I love this post! Ireland has been a bucket list item for me since I was a teen and I’m hoping to make a trip out in the next year – fingers crossed! I’d love to check out the Wild Atlantic Way. 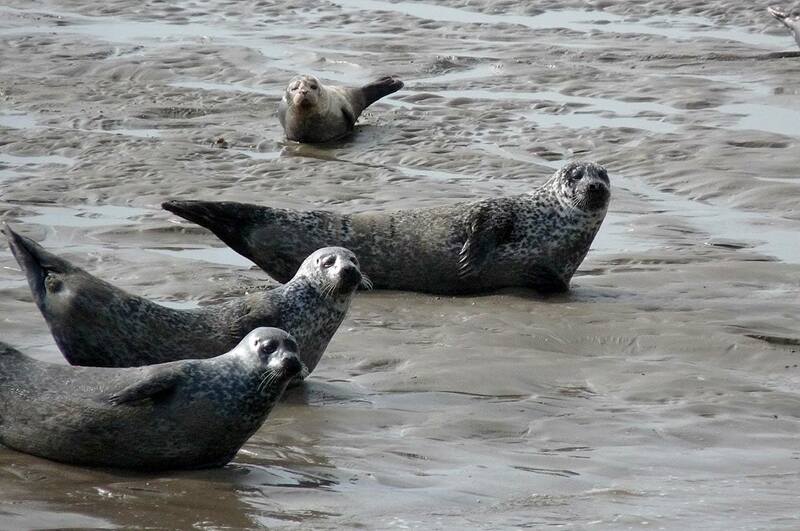 I’d definitely want to stop at Donegal Castle and spot some harbour seals at Donegal Harbour! Bryna, I hope you make to Ireland as well. There is tons to do and see…all fun. it’s been a long long time I’ve been to Ireland. 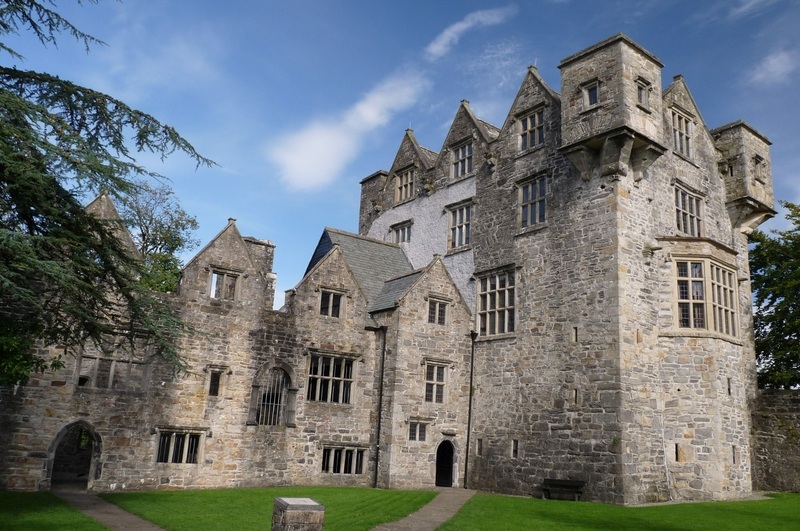 I just thought I had visit donegal castle, but I didn’t (it seemed similar to another I did visit). The cliffs look amazing and worth a visit. Shere, There are so many wonderful castles in Ireland…and we loved Donegal. How gorgeous is Denegal?!? We’ll be on the southern end of Ireland shortly, and it’s killing us that we won’t have the time to explore more of the Wild Atlantic Way and the northern half of the country. We’re just going to have to plan a return trip…before we’ve even left on the first one! 😉 Thanks for sharing Donegal with us – it really reinforces our desire to see the area. Rob, I always feel that way about a trip as well. There’s always too much to do and not enough time.